Lowering 04 van, super low. Hi all, I'm new on this forum and new to the Berlingo world. 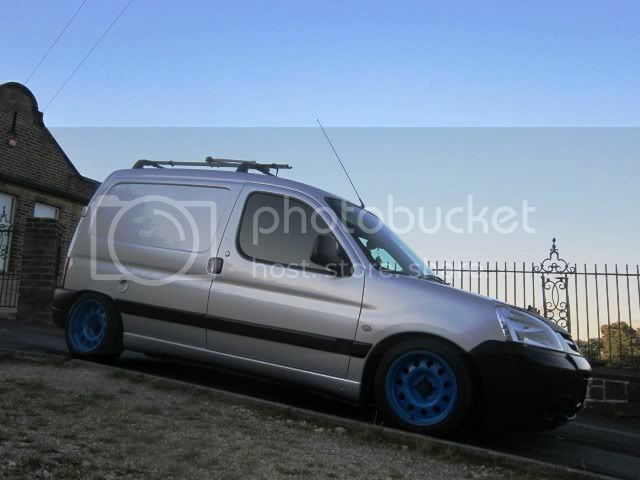 I have a 04 plate 2.0 hdi van and am looking to lower it. I want it very low but can only find springs that lower 40mm. What has every one else used to get super low? Is there such things as coil overs for these models? Thanks for any help you can give me, I will get some pics up soon. Do you expect to lose ride comfort or have you further plans ? I'm a mobile mechanic by trade specialising in cambelt replacements so do not need to carry that many tools and not much heavy equipment. Ride comfort is not essential to me, I'm used to driving modified cars. It does feel comftable at the min but my tools tip everywhere when going round corners and islands, I'd just like to improve the cornering of the van in all fairness. What's everyone else using to lower there vans say 80+mm? (13-09-2012, 12:35 PM)vagempire Wrote: I'm a mobile mechanic by trade specialising in cambelt replacements so do not need to carry that many tools and not much heavy equipment. Ride comfort is not essential to me, I'm used to driving modified cars. It does feel comftable at the min but my tools tip everywhere when going round corners and islands, I'd just like to improve the cornering of the van in all fairness. This looks about the right height. I like it. Any particular model 306? Harsh but they do the job! I'll get some on order next week. I'll get a build thread up soon too. Going to be doing the back out to suit my needs aswell. Bet it's a bit easier to get your bike on the roof being that low aswell isn't it.